With the RX0 II, Sony is launching a miniature camera that shares its compact and robust case with its predecessor, but also has a new image sensor and internal 4K recording. The RX0 II features a rugged waterproof housing (up to 10m). A special feature of the action cam is the tiltable 180 ° monitor, which allows the user to always keep an eye on his image. The 1.0-type sensor and advanced image processor perform AF with eye detection and soft skin effect. With the internal recording function image-stabilized 4K films can be recorded with 30p. Sony also includes a 1,000-fps recording mode with uncompressed 4K HDMI output. The RX0 II supports S-Log for more flexibility in post-processing. The LC display can be tilted upwards by about 180 ° and downwards by about 90 °, making it ideal for selfies and vlogging, among other things. Since the camera is waterproof and dustproof, the display also works underwater. It includes a microphone jack to allow the connection of an external microphone. The continuous shooting function of the RX0 II can shoot up to 12916 standard JPEG images in succession. The Exmor R 1-inch CMOS image sensor features 15.3 megapixels and a Bionz X image processor that provides a wide dynamic range, reduced noise, natural-looking detail and fine color gradations. The photosensitivity should be at 80 to 12,800 ISO. 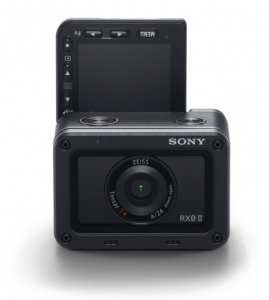 The Sony RX0 II will be available from May 2019. For more information about the RXo II, click here.